From ref 38 we learn that when George 3 came to the throne in 1760 the political status of the Jews had changed very little since their readmission under Cromwell. They could not hold any civil, military or corporation office. They could not be schoolmasters, lawyers or members of Parliament nor could they vote at elections (if the usual oaths were required), and legal opinion was divided about their right to hold land. Simon Barrow converted to Christianity with his family in 1828. In 1836 he was elected Alderman and then in 1837 Mayor of Bath. The role of the conversion in his electoral success was probably vital, as is the way it may have facilitated the entry of so many of his sons and descendants into the army and other professions where they became very distinguished. His wife was buried at the Jewish New Cemetery she died in 1828 the year of Simon's conversion. He was buried in the (Christian) Ryde cemetery. The army and the Anglican church were perhaps seen as perfect ways to place one's offspring now that the adventurous Atlantic trading career of the Barrow Lousadas was over! The marriage of his daughter Tryphena to John Baruh Lousada took place in 1832. This was the only marriage between the 22 cousins. 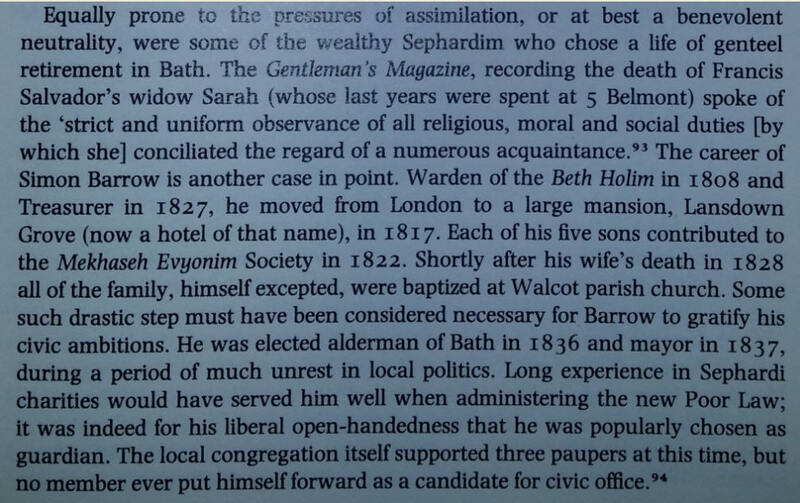 Given that Simon Barrow of Bath had vastly changed his situation from influential Jew to aspiring politician it is not surprising that his son-in-law followed suit and their children were baptized. Two of the daughters of John Baruh Lousada became Anglican nuns. Two of his grandsons became men of the cloth and one of his great grandsons. Not all of the offspring of Moses Baruh Lousada family converted - the descendants of Guershon aka George Baruh Lousada remained Jewish for many generations. Mary Lousada married the Reverend John Bacon, and there were many ecclesiastical representatives in that family.